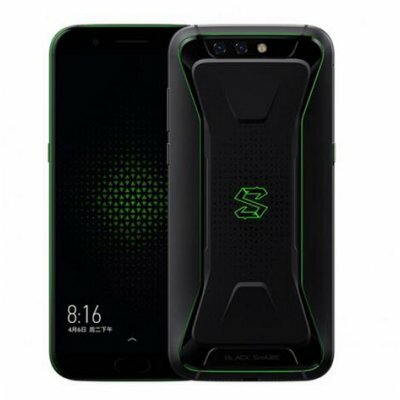 Successfully Added Global Version Xiaomi Black Shark Gaming Mobile Phone Snapdragon 845 6GB 64GB 5.99 Inch Black to your Shopping Cart. Featuring Snapdragon 845 octa-core CPU, X type smart antenna, Professional MIC, Multi-stage direct-contact integrate, Independent image processing chip. Liquid cooling system, deliver fast and fluency experience, 4000mAh long-life battery with long standby time and talk time. SHARK Key: One key to enter the high-performance game space, gaming phone. 5.99" 18:9 full-screen display, dual SIM dual standby (Nano SIM Card x 2). Black Shark gaming mobile phone runs the Qualcomm Snapdragon 845 mobile platform, meaning you get Snapdragon's powerful AI engine on their most advanced flagship 10nm class chip. Enjoy unbeatable performance and lower power consumption. 5.99" large screen, support DCI-P3, the color gamut of up to 97%, with an ultra-wide field of view of 18:9, playing games cooler, compared to the 16:9 screen, faster to find both sides of the target. The 4000mAh(typ) high-capacity battery has the endurance to keep black shark gaming mobile phone going as you game, watch videos, snap pictures and more without a second thought. It provides enough power for 30 hours of calling or 146 hours of audio playback on a single charge. Support quick charge 3.0. Drained battery? No problem. Fast charging rapidly replenishes power. Large aperture dual cameras, professional portrait mode; intelligent scene recognition, dark light quality enhancement; from soft light, self-timer more clear. In the game, use the fingerprint key can call out to the Dock, and more than ten kinds of optimization functions protect the game.